The scene outside the Chaac Mool food cart was tranquil on Saturday. Luis Vazquez manned the burners as his wife, Maria de la Luz Vazquez, took orders and passed plates heaped with tamales, nachos and cochinita pibil through the window. Three of the couple’s children played near the cart, which was parked at the Hayes Valley Proxy Project for a dry run before setting up shop in Dolores Park next week. Even Chicken John Rinaldi, the man who vows to stage a puke-in protest next weekend when the cart opens in the park, came by for some tacos, according to his Facebook page. But the Vazquezes say they’ve never talked to him. 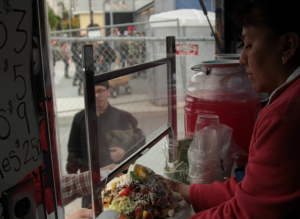 The Mayan food cart is at the center of an increasingly hostile debate about whether or not businesses should be allowed in Dolores Park. On one side of the issue are the Vazquez family and the non-profit food business incubator La Cocina, who say the cart will add to the park’s vibrance and nurture small business. On the opposite side are Rinaldi and others who believe the cart’s presence will commercialize public space and usher in privatization. But Rinaldi said last week that he and his supporters were ignored when they raised concerns with the city and had to “lower ourselves to threaten to puke.” He asks business owners and residents to sign a Take Back Our Parks Petition. Maria Vazquez serves a customer. The couple are a little nervous about what will happen next week when they open in Dolores Park. They aren’t underestimating Rinaldi, a one-time mayoral candidate and high-profile activist. “We know he’s a powerful man,” said Luis Vazquez. 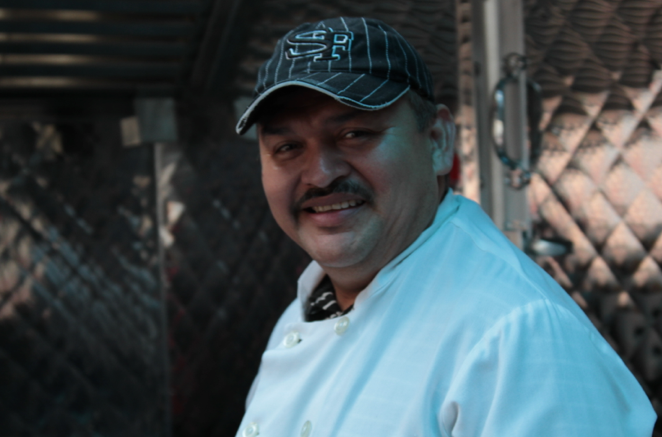 Luis Vazquez is from Mexico, where taco stands and hordes of people share park space without a problem. The cart will employ seven people, he said. Standing outside the gleaming white cart, Maria de la Luz Vazquez said she’s offended that some of the cart’s opponents have tried to paint her family as outsiders. She opened the door to the cart and called her two sons, ages six and eight, to her side. “They were born in San Francisco General Hospital,” she said. The boys, both with glossy growing-out crew cuts, stood and fidgeted a little. The family lived in the city for more than a decade until high rents finally drove them to Oakland. Bridget writes about community groups, non-profits and collectives for Mission Loc@l.
Chicken John is an idiot, Chaac-Mool and La Cocina are gems, but public parks should remain private commerce-free zones. First Chaac-Mool, next Starbucks with privatizer Phil Ginsburg in charge. why does anyone even pay attention to chicken john ? his entire reason for existence seems to be to desperately try to get people to pay attention to him, and he seems pretty terrible at doing so from what i’ve seen. Next thing you know we’ll have full-fledged restaurants in the park, like the Moss Room and… oh wait. and is referred to in the above article. This reporter descirbes a “hostile debate”. I’m failing to see where the hostility is. Anyone see any hostility? Puke In, Dolores Park, Saturday April 30th 2:00 PM. why do you hate latinos ? that’s funny, i don’t see asking questions as desperate, maybe you do, because you don’t have answers. now threatening to puke like a whiny little child who didn’t get their way.. THAT’S desperate, don’t you think ? how’s that petition going ? R Mortimer – your comment about ‘hating latinos’ is desperate. This whole issue goes beyond one taco truck and fake vomit. Your mentioning of ‘race stuff’ belittles real race issues and should do a little more research on this issue before you even take up an opinion. I will be at Dolores to buy a taco this weekend. fyi the pathetic chicken john is an investor in ritual coffee… there’s a word of mouth boycott going on in the hood, we are sick of this loudmouth speaking for us… join us. ame – your FYI is old news… ‘investor in Ritual Coffee’ and not 100% accurate, but that is cool, just keep on keeping on with your half cocked information. ALSO, what does that have to do with a trailer in the park? Please speak up and be specific. ALSO, if you are gonna boycott Ritual Coffee based on whatever you think is truthful, you should absolutely do it. Chicken John IS NOT Speaking for you. You need to speak for yourself, boycott what you like, just like myself and others will do. So why give us(those apposed to park land being used for commercial space) a hard time about it? I support your future boycott. You need to get full cocked. Chicken John signed his own petition twice, unless ‘Chicken John’ and ‘John Rinaldi’ are actually two separate individuals. What about the people who are ok with the cart? A lot of people seem to be just fine with it – so, dear Chicken John, when you speak for the ‘community’, you remind me of Republicans who always claim to speak for all Americans but are really just speaking for a weird crazy few evangelical Christians. Maybe you should have tried an alternative, like a fundraiser for the park to raise some of the needed cash, rather than a stupid publicity stunt. Do something constructive for once. stupid publicity stunts are the only skill he has though. LS -Yes, what about the people who are ‘okay’ with the cart? Like yourself, right? You are passionate for carts in green spaces and spend time making comments on bloggy things like this, as a show of support for commercial vending in our public parks, great. Others have to spend there time going to CITY HALL and putting together petitions (this might be the third one I have signed on this matter) and gathering info and doing research, etc… to show their passion of parks remaining FREE of commercial entities. And MONTHS ago, a small group of people DID start a fund raising effort on behalf of the park. I heard the PARKS AND REC were not interested in certain types of donations in lieu of trailers in the park. So, yes, this is all very tiring and when people like yourself just say , “Why don’t you just do this?”, because it has already been done. Read up about the PARKS AND REC dept asking Burger King, Orange Julius, Applebees, mortgage brokers, out of state companies, and a massage parlor about permits in the park. Why should we have to give MORE money to the park to pay for upkeep? We didn’t have to to that 10 years ago, 20 years ago ect… what changed? Why now? And why is it a good idea to take away public space and put a commercial business there? Can you defend that? It would take 33 taco trucks to pay for the maintenance at DP. Are you OK with that? How about if we sell the name of the park to…. Doritos. Doritos Park. How’s that grab you? When is too much? Why should we pay more money? Because, let’s see, the park’s bathrooms need an overhaul. That costs money. Due to massive usage and trashing every weekend the weather is nice, more people need to be hired to maintain it – not just their salary, but their health care and their pension. Also, the city pays for a lot more things now than they used to – so the cost of everything goes up. You didn’t bring any dialog to the table other than ‘no’. ‘No’ doesn’t accomplish jack and I don’t blame people for ignoring you and finding a solution. And you know something – if my choices were no park and a park named Doritos Park with a couple of food carts, I’d take the name and the food carts. You can’t have everything and if you can’t come up with anything besides your pathetic whine, you don’t deserve a park. But why now? RPD always had enough money before, right? We now have to pay for a service which used to be free, because RPD mis-manages it’s budget? So they sell our clubhouses? Sell land? Charge fees to get into public space? That doens’t make you wanna puke? 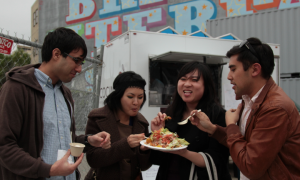 Dolores Park is crowded enough without a food truck and generator taking up space. If we need more government services then we should raise taxes or cut other services. Our tax money is supposed to pay for the upkeep of our parks. If we really need a full-sized food truck at Dolores Park, take out a couple of parking spaces and put it on the street next to the park. What’s more valuable in this town: concrete or grass? LS – that is your problem, you limit yourself with choices: NO PARK or PARK NAMED DORITOS PARK with TRUCKS. How about PARK with kids and dogs and families and frisbees and laughter and the sound of butterflies? Why don’t we try cleaning up after ourselves? If people used the time bitching about chicken on the internet to just go scrub some toilets and pick up some bottles, I think that would be a start. I usually pick up bottles/cans monday mornings. if you believe that, why is there a petition and a protest ? people will decide not to support the privatization of the parks and not patronize the trailer and the problems will magically go away.. right ? right ? MORTIMER – you don’t understand sarcastic, or hyperbole, or the real issues with putting commercial entities into green space. Problems never really go away with effort. That is why the need for a petition, for a protest. Remember when people would protest things and other supported it? Down with the man and commercialism! Now, people, just like yourself, are too snarky to give a crap and spend time picking apart others structured and thought out arguments. Tell you what, if you really care about trailers going into the park and are FOR permitted vendors and generators and more trash and people and all the things that go along with having commercial ‘stores’ in the park; you start a petition in SUPPORT of. Chickenshit Toilet: You are correct. Shut up or else you will further solidify opinion to the contrary, in support of privatization because you are an idiot. What part of White idiots threatening families of color distracts from the privatization debate does your thick skull crammed chock full of coffee grounds not grasp? oh, so chicken john is racist against latinos ? thanks for clarifying the situation, that explains a lot. That’s how the optics get played, suckah. how much are you paying in taxes to the city anyways ? I would spend all of my time at Doritos Park if I knew that Chicken John would never be found there. oooh, what a sinister comment, you should change your bloggy moniker to VINCENT PRICE. “They say.” I love it. She bases her conclusion on gossip and then says that I’m the one with communication problems. You do realise that this ‘writer’ didn’t bother to contact me before she wrote this gossip, right? Now I’m racist against my own people. Right… keep going… you’ll end up in fairyland soon enough!!!! is this really about the privatization of parks or is about your buddy at ritual being afraid of competition and you not wanting to see a hard working latino business succeed in the mission ? do the ~200 people who have signed your petition know about your hidden agenda and what’s really driving you here ? also have you considered using a spell checker ? you apparently need the help. Way to run a smear campaign, Randolph. And when did YOU stop beating your wife? i’m not married, and please keep your heterocentric prejudices and assumptions to yourself. MORTIMER – how are hard working latinos in competition with Ritual Coffee? You are also bottoming out with ‘insults’ that you are relying on ‘spell checker’ zings to make a point? Quick, name all your hard working latino friends. Also, now that you have acknowledged the 200+ people who have signed the petition, why don’t you back off of Chicken John and start attacking those 200+ people. Mix it up a bit. Or just go back to those bunk Orange Crop reports. How is a coffee shop 6 blocks away that is owned by someone who is not politically active have anything to do with a puke a thon in a park that is just a joke? Your desperate to find something to nail me with, you can try some more I’m here. Keep bangin’…. Hidden agenda. Hysterical. I’ve been fighting against privatization for 25 years. the agenda is to not have our public space privatized. There it is. Isn’t the Proxy Project also a privatization of public space? Isn’t Burning Man a privatization of the Black Rock Desert? It’s kinda a good point. Burning Man does take public land and make it private for a month. I don’t want to defend it, but I will say that it’s only a month, it’s on a year to year basis and the black rock desert is 500 square miles. All that being said, special permits for festivals and such have existed in the commons since time eternal. How do we handle this? Carefully. But I don’t have all the answers. My intention here is to facilitate a conversation. Not really facilitate, just create the space for it. There was no conversation 3 weeks ago. Last monday night I went to the Mission Merchants association and not one merchant even knew there was a trailer going into the park. Look, Chicken. This ain’t burning man. And I can’t STAND the fallacious/paranoid logic that this is some slippery slope into your own personal vision of commerce hell. Show me the *complete contiguous line* from point A (family and locally owned, perfectly legal and licensed food truck in the park) to point B (starbucks and taco bell). I also find your choice of battle, and the level of effort applied to it, either suspect, strange, or sad. You ARE the tea party in slightly different clothes. BUCKLES – please start chocking on this, I will finish you off later. Well, I agree with you that the slippery slope arguement is slightly lame. I know how the real world works. But RPD is selling 23 acres of parkland in hunters point. Is that a slippery slope? Or is that RPD selling 23 acres of parkland? To me, it’s that once there is privatization, it will just always be there. Forever. Which is why we have to stop it, or at least decide that that is what we want/need. We are being steamrolled. What strikes me is that I have not seen a single post here, or anywhere else in support of Chicken’s stupid plastic puke protest, other than Chicken himself. I’m against plastic puke but in favor of the publicity it brought. I hate it when our public servants (ha!) try to sneak this kind of thing in, and then tell you it’s a done deal. Agreed but that’s my entire point (which has been heatedly argued with Chicken on FB today). Threatening to puke on food trucks has NO correlation with the privatization of the parks. Attempting to intimidate small businesses doesn’t get his point across. It doesn’t get any point across. There are much better ways to generate publicity that would be more effective to getting his damned petition signed. This IS however effective at getting HIS name in the paper. Notice it was his name, not the cause that got attention. AMY – You should blame the ‘media’ for your attention being gotten by CHICKEN JOHN rather than the Issue. All the mentions of CHICKEN JOHN’S past antics, his relationships and affiliations, his running for mayor, its all great theater, and distracts from the fact that PARKS AND REC don’t give a crap about you, the park, neighbors in the park, etc. Amy, do you think this is the way I prefer to petition my government? It most certainly is not. And do I have anything against Chaac? No. Did I ever say that I would puke on them? NO. Did I say I would puke on their trailer? No. there have been 34 articles and not one writer has interviewed me. It’s all cleverly worded gossip. Why did I do this? Well because I tried the regular avenues and they were broken. I coudn’t get anyone to write anything. What do you do when you can’t get the press to report on an issue as important as this? You do this, and you hope that people are smart enough to not get stuck. And please tell me if you are not down with ATT taking public space away for private enurement, then how what Chaac is doing isn’t the same thing. Please. I am amazed at how so many commenters are confused on this issue. Admitedly CJ is a polarizing figure but lets not damn the message because of the messenger. I think we need to pick our battles. If it was Starbucks, I would agree but its not. It a small immigrant family business. They are from the area and have been here longer then most of the folks that go to dolores park. Sure, luckily LA COCINA was ‘chosen’ versus the list of other possible vendors. See above. Again, just an example of how PARKS and REC have made a mess of this whole thing. Yep, La Cocina and Chaac Mool are the bait to lure everyone into the privatization trap. What matters is being right and winning, not just being right on the policy. You’ve been framed as attacking immigrant Latino businesses, should have thought about that and crafted your approach accordingly. It does matter “who” because they’ve successfully conflated the “who” and “what” on you. Is this like the parklets that are on Valencia St. They took public space that people pay for to use, somewhat like the parks for events. They take that away and let someone (a private business)build it and then pay for it on a regular basis with permit fees yearly. They say its public space for everyone to use, but we know its soley for the benefit of the buisness and the city. If your young and brown or homeless the cops wil remove you. If thats the case then parklets are also privatizing public space. I can take it. How bad can it be, I’m 1/2 Latino! The widening of Valencia Street’s sidealks and adding in of restaurant tables to make the sidewalk as narrow for pedestrians as it was previously is another example of privatization. But the parks are sepcial. This is why Chicken John and ipecac crowd should patronize a Mission District taqueria for some to-go tamales prior to the next Rec and Park Commission meeting, usually the third Thursday, room 416, City Hall, slather said tamales with ipecac, and express to the Commission their sentiments on privatization, because that is where the power is. @Ian, they are immigrants, right, most of us born-in-the-USA folks have been here longer than most immigrants. The issue here is one of power. White folks have more power than recently arrived Latin American immigrants. The government and big business have much more power than all of us. In this instance, government is using immigrant business to challenge the previous consensus that parks are commercial free zones. chicken john ran for mayor and lost. why does he hate democracy ? why does he believe the ends justify the means and want to see hard working latinos unable to run their business ? why does he believe threats and personal attacks are an acceptable way to get what HE wants ? is he some kind of anti-american domestic terrorist ?? MORTIMER – It’s like you lost a bet or something and the punishment is that you have to post dummy comments and make remarks that are confusing that come off sad and silly. A lot of people lose running for Mayor. Its not just him, its thousands of people who don’t want parks privatized, you refuse to see that side of things. What personal attacks? Chicken John is the one that is being attacked. Mortimer, you are a buzzkill. your reading and comprehension skills are really quite lacking. i bet you didn’t even read the article and are some chicken john fan/drone. I read. I read you loud and clear. You are sad and enjoy sounding dumb. I support people who speak up and are passionate about things. I am against people who are named Mortimer and not aren’t starring alongside Eddie Murphy. The greater question remains that while immigration is culturally awesome, economically why should immigrants be given a leg up on folks who have been here for centuries and are still downtrodden while the US economy is structurally contracting? As the immigrant rights movement has crested in SF, the black population has dwindled. As the Chinese immigrant population has grown, the Latino immigrant population has taken a back seat to them. Except when Latino immigrant small biz is needed as a battering ram for privatization. I guess it all depends on who has the nonprofit resources to make the loudest stink as to who get heard the most in this sham of a democracy. Note: only those who are in sync with corporate power are the ones who might get heard. Maybe. Extra points if you’re connected to Rose Pak and the happy go lucky Democratic regime in Beijing. With all of this celebration of economic immigrants, we tend to forget those of us who immigrated to SF from the flyover to avoid meeting the fate of Matthew Shepherd and for whom Dolores Park is our commons. Given the celebration of the hetero family, the stroller brigades, and of economic immigrants making the City family safe by erasing the queers, how long will it take for outrage to mushroom and put an end to Dolores Beach? Some immigrants are more equal than others, apparently. I think that the point actually is that no matter what kind of immigrant you identify as, we are all the public, whether or not we acknowledge it, and are having our common assets sold out from under us. Any other “us vs. them” scenario is part of their strategy. See how well it works? Uh oh, I know what’s coming next… Why do I hate democracy? Why do I hate freedom? A Puke-in in front of Landarmark´s appalling Gracias Madre and every other cultural appropriationist, white, hispter, PRIVATE establishment or PRIVATE hipster pie, vegan chili or argula wraped salt caramales street cart´s on Valencia YES!!!! Against the taco truck? Hell no!! EAT IN more like it. I am opposed to chain businesses operating on Valencia St. I would not suggest a vomit-a=thon on the Ritual Coffee outlet on Valencia St. If you should decide to act on your own, the owner is someone named Eileen. You can ask for her the next time you pass by (unless she is in the Napa outlet of the Ritual Coffee chain). Tell her that you do not appreciate her franchise. If you choose to vomit on her, make sure you mention that Chicken John does not like chain stores on that block of Valencia St. either.That was his “cause” six months ago. @THEMISSIONMAN – I like that you stay on top of Chicken John’s movements (bowel or otherwise) and his stances on causes, nice moxie. Why don’t you quit beating around the bush and if you really want to boycott Ritual, do it. Get a petition, start a Facebook page, make an effort. All this passive aggressive anonymous smack talk and half a$$ed attempt(s) at being passionate or actually doing something about what you believe in , is sad. Please note that Chicken John’s beloved Burning Man (that mono-culltue, $600 a ticket “art festival that he and his white friends can’t live without) is on public land. Must be great to be a privileged white guy with lots of time and lots of money. Oh wait, now he is claiming to be Hispanic! How does a chicken make so much bull sh*t? can someone start a petition to boycott ritual because of their association with john rinaldi and his anti competitive anti american anti latino activities ? then we can see who has more support. ONCE AGAIN… poor trolly RANDOLPH MORTIMER needs OTHERS to act and speak on his behalf. “Can someone *else* start a petition”? Hey lazy goat, why don’t you start one? this is how it feels to be trolled. seems like you’re loving it.